Add a touch of glam to your living space. Elegance shouldn't have to cost a lot. The La Rosa collection by Jennifer Taylor Home is an ideal choice for the den, office, or living areas. Crafted beautifully with solid kiln-dried birch wood, upholstered with high-quality fabrics, and accented with diamond hand tufting, turned legs, and nail trim accents, this 3-seater sofa brings class and lounging comfort to any room in the home. We offer a unique versatility in design and make use of a variety of trend inspired color palettes and textures. 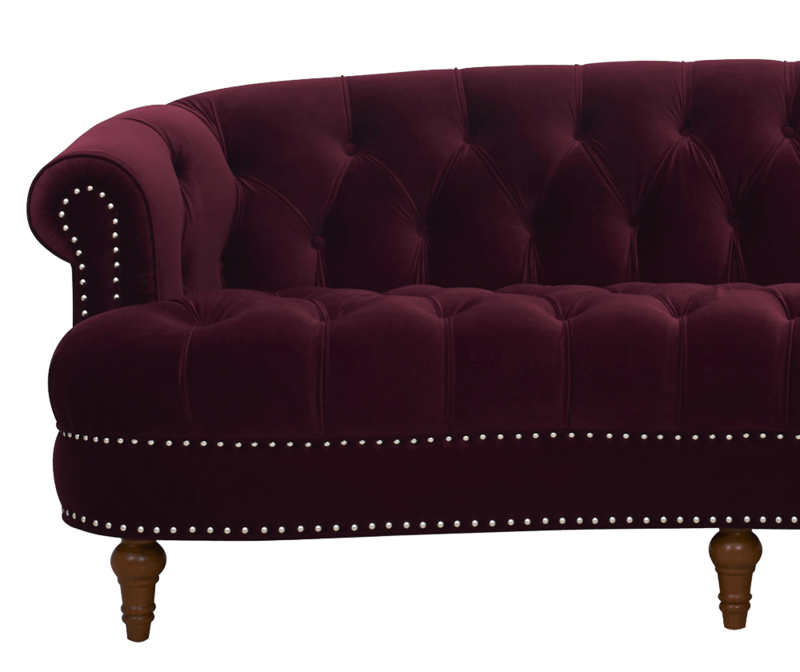 The La Rosa Chesterfield sofa features rolled arms, hand-tufted backing, and seating, and hand applied nail head trims, covered in luxurious velvet. Showcasing an elegant look and comfort that is only available in a Jennifer Taylor Home design. This is a very nice looking sofa! It's not a lounging sofa, rather it's a firm sofa probably best suited for a formal space with limited use. It looks great, though! Cant tell u how much we loveeee ittttf!! Love the feel of the fabric, and the cushioning is just right. Everyone who comes to our home loves it. Seats three with generous spacing, even seats four fairly well. 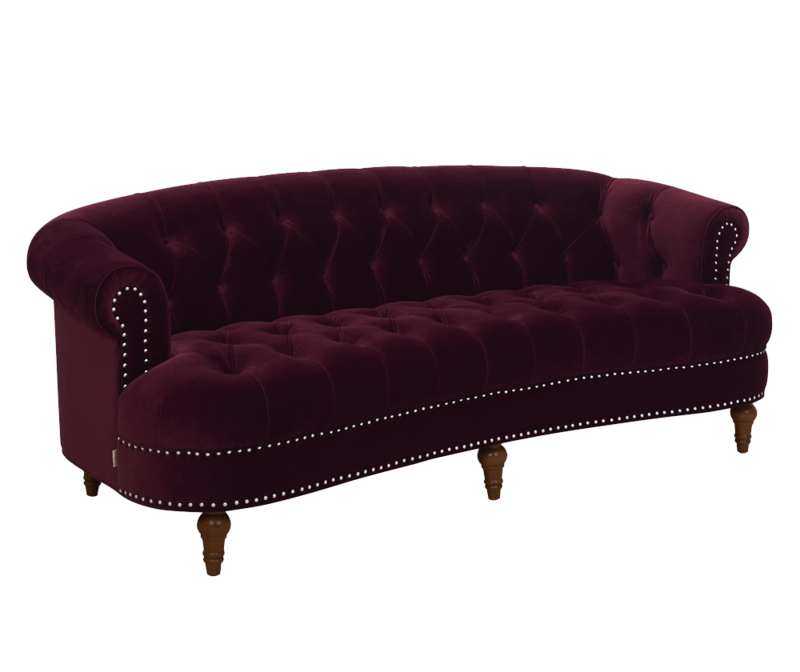 I absolutely LOVE my Ash Rose Chesterfield sofa! I’ve been watching this beauty for almost a year. I bought this for my bridal boutique that I’m opening so please excuse the mess in the pictures. The sofa looks just like the pictures and it’s extremely comfortable! I have even napped on it several times already. I’m 5’10” so I can’t stretch out of course, but it is deep enough that I can bend my knees comfortably. I do recommend pillows for the back of the sofa because it is a bit deep. The button tufting and silver nail heads are done beautifully. It also has a 5th leg for support. The velvet is thick and soft. The color is like a dark blush, beautiful! The curved shape is gorgeous! I love this couch. The material is soft. It feels amazing. It looks fabulous. Gorgeous couch! I bought the grey for my formal living room...love love love! Was a bit nervous about ordering a couch online but it arrived perfectly. Tip--measure your existing couch so you have a reference point for size!